It has occurred to me recently -again- that we as Americans do not have much of an understanding of history – at least not in the European sense, and certainly not at all from the Asian perspective. We tend to think of our own history, say of the ‘old west’, as ancient – yet a figure as central as Wyatt Earp in that old west history only died as recently as 1929. 1929! For god’s sake, I came into this world only a few years later than that. In the grand scheme of things, that is not history at all. It’s just amazing how quickly we tend to see things as historical, old and outdated. I suppose as we grow and mature, it is human nature to get enthused and energized about all the ‘progress’ around us – I certainly did – we must have everything new that has just been developed – it is not acceptable to continue to use outdated things. And I guess it is also human nature that as we grow older, we either tire of the effort of trying to keep up, or we slowly realize the folly of doing so – or both. Is it really progress to have rejected quality for speed and to have traded taste for convenience? For the most part, our current society has answered Yes to these questions – and the old ways are relegated to history – and history is bad. But now that I am old enough to pause, I think it’s important to try and rethink and recapture at least part of what we’ve missed as a society by our rejection of the way things were done historically. And a good part of our ‘old fashioned’ culinary history is the unique way that cooking and baking was done historically – I often speak of the ‘granny method’, and what I mean is simply that in olden times, cooks and bakers did not use recipes –cookbooks are a relatively new invention– they simply had a feel for the ingredients they used, and for the dishes they made – it was all in their head. And if they didn’t have a particular ingredient, they knew just what they could sub for it, and how much. That was the granny method – and it is my contention that even today, a real cook or baker has not matured into self confidence and self respect until they have reached this level of expertise – their own personal granny method at work. In my own evolution as a baker, the one item associated most in my experience with the granny method was the bran muffin. I’ve loved bran muffins for as long as I can remember, and I have baked them for almost as long. If one is interested in learning how to bake something from memory, it should be something they bake often – and for me, that meant a bran muffin. As I’ve suggested above, when one utilizes the granny method, it means that one has learned which parts of the process are inviolate, or absolute rules – having said that, I learn every day about exceptions to baking rules I once thought absolute, but surely, good bakers attain consistency by adhering to certain rules – so it’s a wise practice to follow, until experience suggests otherwise. The flip side of that is that there are parts of the process where all sorts of substitutions can, and should, be made. Put together, these two elements of the granny method result in the baker gaining a ‘feel’ for the creation of the product in question – in my case, the bran muffin. My mother made her bran muffins by using a bran cereal, as do many even now – but cereals all have unneeded additives and heavy doses of sugar, so I choose to use raw bran instead – I don’t know if raw bran was available in my mother’s time, but All Bran cereal was (introduced in 1923), and that’s what she used. But the use of raw bran gives one more control over creation of a more natural muffin, and I think that’s a meaningful goal. So for me, one rule is the use of raw bran in my bran muffins. Besides, it is very good for you. 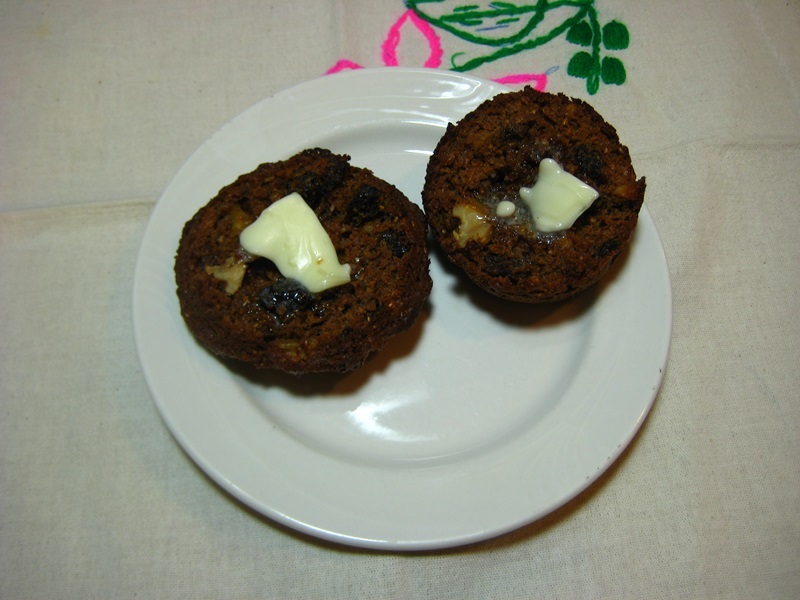 Rule two – purely personal again, I always use molasses in bran muffins – not only is it much less processed than white sugar, which I truly believe is toxic, and will one day be banned from human consumption, but molasses also adds a depth of flavor complexity completely missing in sugar. Because I’m using a relatively small amount of molasses, I bump the sweetness level up a notch with a few tablespoons of Splenda, and together these two sweeteners do a nice complete job – at least to my taste. I also employ a third rule when I make muffins, any baking powder muffins, and that is to mix all your dry ingredients and wet ingredients separately, and only at the last minute put them together. The reason for this is that baking powder does it’s job of leavening both by application of heat, and by application of wet ingredients – so if you mix in your wet ingredients too early, half of the rise reaction will be over by the time the muffins hit the oven. Mix all above in a medium bowl and set aside. Now take a large 2nd bowl and mix the following together. And after you’ve made these a few times, you can begin making your own variations, such as adding a few Tbs of cocoa and coffee powder (for pumpernickel muffins) – or chocolate chips instead of dried fruit – or oats and dried blueberries with a streusel topping. Whatever your imagination can come up with. And best of all, you’ll soon be able to make them without looking at a recipe, because you will have developed a feel for how to make muffins – any muffins. I'm a guy with enough time to do as I please, and that my resources allow. The problem(s) are: I have 100s of interests; I have a short attention span; I have instant expectations; I'm lazy; and I'm broke. But I'm OK with all that, 'cause otherwise I'd be so busy, I'd be dead in a year. This entry was posted in Baking, Comfort Food, Food, Our Favorite Dishes and tagged Bran, Bran Muffins, molasses, raw bran, Splenda, Whole Wheat Molasses Bran Muffins, Wyatt Earp. Bookmark the permalink. Your muffins are wonderful and these bran muffins were especially good; the only problem is you will never make them the same again! I especially like the ones you put together on the fly using bits and pieces that are left over. Recipes? No, that’s not in your realm of possiblities! Keep making muffins-all my friends and acquaintences love them! If they are truly good, much of that credit, my dear, owes to you – my most objective and constructive critic. How can I not continue my daily pleasures by baking more for you. Fret not. With the exception of your substituting Splenda for sugar, this is a wonderful post, beautifully expressing your love and passion for baking – real baking. I agree with you about sugar being toxic, But think about it – Splenda is equally so – if not more so – in that it contains aspartame…which is deadly, in my opinion. It is much more artificial than processed white sugar is…and, as dangerous as processed whtie sugar is (I agree with you on this, believe me), I wouldn’t touch Splenda with a ten-foot wooden mixing spoon. When I make bran muffins (not as often as I’d like to, but after reading your brilliant post here, I’ve just been re-inspired to bake up a batch…possibly for tomorrow morning’s brekkie), I also use molasses, but if I don’t have that on hand, I’ll use either golden syrup or honey. Other than the Splenda vs. sugar thing, this is truly wonderful. This is real baking…baking as it should be. Thanks for sharing your thoughts and the recipe with us. Thank you very much for stopping by and for your kind words and thoughtful comment – I’m sure your sentiments contain much truth, perhaps enough that I will one day regret my decisions regarding Splenda – but I think each of us must make these kind of daily decisions from a very personal perspective, and that means that what seems appropriate for one, may not be for another. In my case, as a diabetic, I feel the use of sugar would surely be traumatically tragic, and although I’m very hesitate to use artificial and highly processed foods and supplements, in the case of Splenda, I’m simply not yet sure it is worse for me than is sugar. I have also weaned myself off the need for sweet tastes enough that my use of Splenda in cooking is much reduced – I hope to a less significant level. But I find your thoughts even more interesting because I believe they reveal another element of the nature of human life, and that is that as we are conceived and born, we enter a strange paradox of existence whereby everything we eat and drink does two opposing things to us – it both nourishes us and it adds another step to the inevitable end path of our life, which is our ultimate end. Perhaps sugar, Splenda, and all other foods of nature are simply part and parcel of that great life puzzle. Thank you much, June, for joining us for some interesting discussion – I hope you will give us the pleasure of your company again soon. I sincerely do hope that I didn’t come across as a know-it-all or that I was judging you (or any of your followers/subsscribers) in any way regarding using Splenda over sugar. If I did come across that way, or my words came across that way, I genuinely apologise for that. It wasn’t my intention to be antagonistic, I feel bad, too, for not realising/knowing that you are a diabetic, and therefore, for you, sugar is very definitely a high-priority toxin to stay away from completely. To each his or her own is the best adage to apply here. Splenda has not been studied long enough or sufficiently enough, nor has it even been in existence long enough to determine what long-term effects it will or may have on us, be they harmful or safe, whereas sugar has been around for a couple of thousand years or more, I’d venture to guess, and after all this time, we now know how harmful the processed variation on the theme can be and actually is. Thanks again, Doc, for welcoming me to this very thoughtful, thought-provoking and intellgent blog of yours. I’ve only just stumbled upon it through another baking blog, and I love when that happens – when you click on a blog link and you instantly love what you’re seeing and what you’re reading. Wonderful! You are more than welcome among us – even more so since you have the courage to contribute thoughts and opinions which move the discussion along – please do not apologize for that! Just keep stopping by and continuing to comment. And I was pleased to see you are among our family of non- US contributors – I love that ‘world’ perspective, which we tend to miss over here. I’m also pleased to see that you are from the land of my forebears, just a few generations removed – sadly, that is another thing that we tend to have forgotten over here, how all of us -with just a few exceptions- are so close to being strangers in our own land. Oh well. 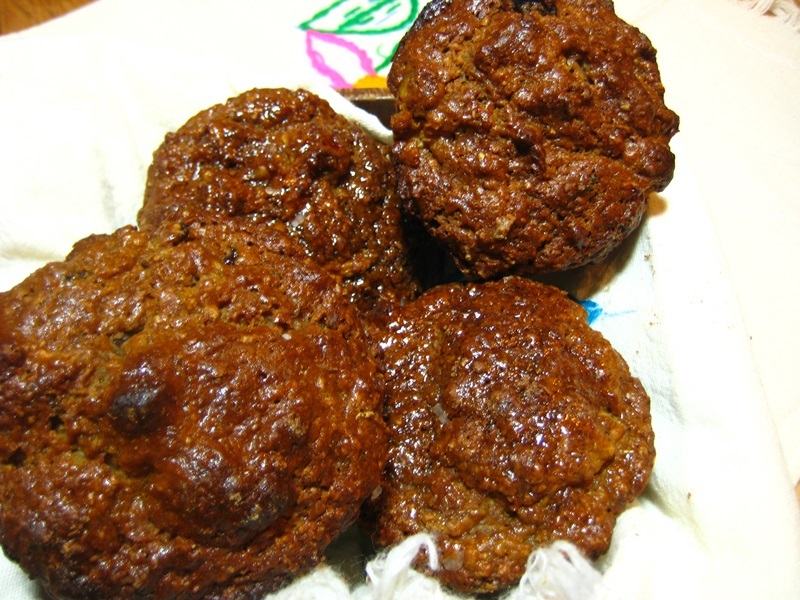 Wholewheat bran muffins remind me of a stage I went through in the 80’s Everything was high fibre, including muffins. I used to add unprocessed bran to just about everything I cooked. You couldn’t tell and it really increased our fibre intake. Maybe I should do it again!! Ah, you are showing just how young you are Glenda – trust me, the day will return when all that fiber will be back in your diet and thoughts. See, you and Glenda are just too young to have an appreciation for bran and its fiber – just wait. Ha! I sure wouldn’t trade my bran muffin for beans on toast – Ha. Oh my dear, you must be like me and simply ignore the indigestion thing (men tend to to do that, don’t they!) and eat whatever you wish. On second thought, it may be far better to simply ignore me. Hee hee, I couldn’t ignore you, you inspire me! splenda is sucralose, not aspartame. my wife is diabetic so she uses splenda because there is no significant aftertaste. You used 2 Tbsps, what kind did you use? I’m only aware of one kind of Splenda – I buy it in large, resealable bags, which tend to last me maybe two years each bag. I only use it for baking, because it’s stable in oven heat, and I only use a portion in adjusting a recipe for sugar (if a recipe calls for 1 cup of sugar, I’ll generally use 1/4 cup each of Splenda and sugar). I used to use a higher percentage, but I’ve weaned myself down. Hi Hernando – You’re right about Splenda not containing aspartame. I was confusing Splenda with Equal and NutraSweet, both of which do contain/are made with aspartame. And you’re also right that Splenda is made with/made from sucralose…which comes with its own ‘issues’, health-wiise. But that’s taking us right back to Doc’s original, thought-provoking words. Forgive me for my mix-up between them. Between the two, sucralose is – according to the research so far, at least – less toxic than aspartame. But because it, like aspartame, hasn’t actually been in existence for very long, no one can conclude, absolutely and for definite, the long-term effects sucralose has on us, our system and our overall health – be it harmful or perfectly safe. Sorry, once again, for the mis-information in my earlier comment. I still would and do stay away from all artificial sweeteners. Even Stevia, which I’ve heard and read a lot of good and positive things about – even in our local health food shop, is something I’m choosing to stay away from. For me, honey seems to be the most natural option. I always like coming over here to get my brain thinking and you never disappoint Doc. The term granny cooking is such a good one. Imagine if there was cooking classes that focused on this kind of method, and more people were to adapt to this way of preparing food and eating… surely waistlines would decrease rather quickly. I’ve seen agave syrup around, but have yet to get any or to even taste it. I did see some comments about how people think it’s a natural sweetener, but it’s actually highly processed. And although it has a low glycemic index, it has even more refined fructose than does high fructose corn syrup, so it’s not a popular diabetic sugar substitute. (natural fructose is OK stuff, but refined/processed fructose is not) I’m just repeating stuff here, I don’t really know much about agave, except that they make tequila out of it. And that’s not bad. We’re all wired to love what’s not good for us. It’s nature’s way. Miraculin? Don’t think I ever heard of it. I’m an avid documentary watcher (every night) and I recently discovered that I could watch tons of docs from YouTube on my Roku (my computer streaming device) and I’m currently into a mass of BBC docs – you guys do much better documentaries than do we! I’m loving it! I’ll try to find that one and watch it. Thanks – I’ll see if someone has posted it on YT – sorry to hear that winter is holding on – of course we know well that next week here could bring a week or two of freezing temps – in fact, it’s likely, now that the blossoms are out! Yes, we too have our Daylight Savings Time, a truly stupid hangover from the days when farmers benefited from an a late sunset – none of that is true anymore, but we still do it anyway. But here, every state can, and often does, have differing schedules, times, and policies – makes driving across America an ordeal.